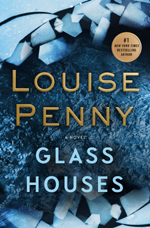 On the very warm evening of August 29, my husband and I joined 1000 other people (mostly women over 60, as it turned out) at University Methodist Temple to hear author Louise Penny. (See my post of January 4.) It was the day of publication for the 13th novel in the series about now Chief Superintendent Armand Gamache of the Sûreté du Québec, Glass Houses. Penny is a charming and compelling speaker, and her fluid descriptions of her writing process kept us all attentive and ready for more. Her husband died about one year ago, and she shared her life with and without him in a way that included us without being overly personal. It was really fun to hear her talk about how the people of the village in which she lives are indeed the characters in her books who inhabit Three Pines, the Brigadoon-ish village of the novels. Three Pines is the place where we all want to live (certainly exhibited by the attendance Tuesday night), and it has the same imperfections as the places where we all live now. Penny stressed the community of Three Pines. She said that if she had any theme or vision she wanted to portray in these books it is that of community’s importance. Even as a writer, she could not do it without the community of villagers and friends surrounding her. And she said her year of loss could not have been sustained without such community, especially as she began writing this book as her husband was dying and in these following months. She said that Three Pines is her safe place, and she goes there each day when she sits down to write. And yes, this blog is back! Yep! Plan is for every day as I am free to do it! Are you at Faith Sunday? A new Slightly Foxed has arrived.